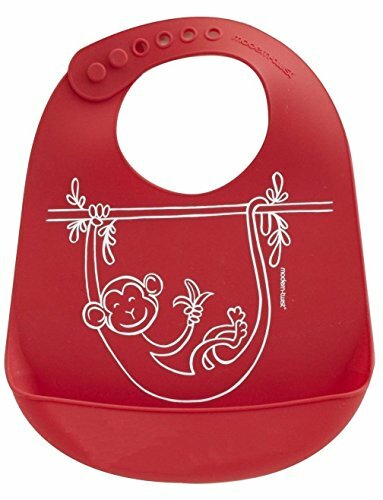 Offering a fashionable, functional, and safe design that will delight parents, the modern-twist silicone bucket bib helps protect a baby's clothes and the floor below from spills and stains. This reusable bib in pink is silk-screened with a whimsical motif designed by an independent artist, and it sports a deep, soil-resistant pocket for catching liquids and food crumbs. Silky to the touch and comfortable on a baby's sensitive skin, it has an adjustable neck strap that fits six-month-old babies and up. Easily portable, the bucket bib rolls up and stores compactly for use at restaurants or on the go. Like all modern-twist products, the bucket bib is made from 100-percent pure, FDA-approved food-grade silicone, a nonporous material produced from natural elements that is free of BPA, PVC, lead, latex, phthalates, and other harsh chemicals. This bib cleans quickly, requiring just a simple wipe down after a meal to prevent staining. It's also dishwasher-safe and won't crease or rip. The silicone bucket bib measures 9 inches wide by 10-1/4 inches long with a 1-inch-deep pocket at the bottom. modern-twist has pioneered the use of pure food-grade, hand-silk screened silicone for placemats, table runners, coasters, baby products, and more with aesthetically inspiring designs that will enliven your home. If you have any questions about this product by modern-twist, contact us by completing and submitting the form below. If you are looking for a specif part number, please include it with your message.